Our passion is Selkirk rex cats - these adorable lap cats that purr all the time and follow you everywhere you go but leave you alone if you ask for this! When you think of the Selkirk rex, picture a rather big, curly, furry and sweet pet. Think of a cat that plays with you, sits on your lap when you are relaxing, and cuddles next to you when you sleep. This breed's placid and gentle nature makes it an affectionate and cuddly cat. They always meet you at the door and follow around for company. Selkirk rex cats get along with everyone and handle changes well and they enjoy playing with other family members and other pets. They also enjoy a resting lap and will fall limp in your arms. This disposition makes the Selkirk rex an ideal companion for single people as well as families with children, and for families with and other cats and dogs. Because of the outcrossing used, the Selkirk possesses a cobby body style – stocky, muscular well boned with muscular torso. The head is round and full cheeked, with a short, squared – off muzzle that creates an excellent showcase for the curly whiskers. The full cheeks are large, round eyes contribute to the breed’s characteristic sweet expression. The ears are medium sized, pointed, set well apart on the gently rounded head. Of the four rex breeds, the Selkirk is the only one with a cobby body type. The hair has a soft, flowing, elegant feel, and the texture is very light. The curl goes all the way down to the skin. Difference exists between the longhair and shorthair varieties of the breed. The coat of the shorthair Selkirk is plush, medium in length, and curls over the entire body. In the longhair, the dense, semi long coat hangs in loose, individual ringlets and has a more dramatic look. 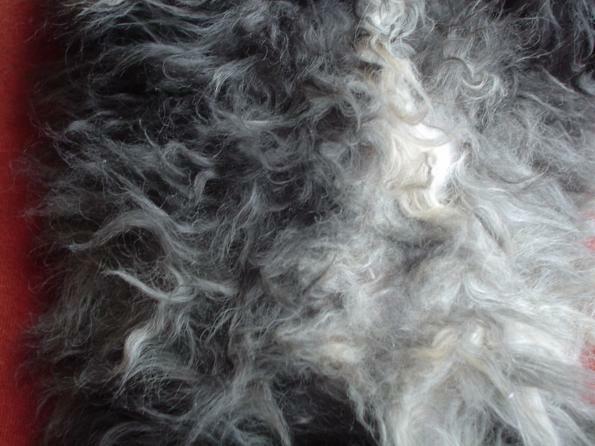 In both lengths, the fur is soft and dense. All colors and patterns are accepted. Selkirks do require grooming, although their fur does not mat as easily as one might expect. The grooming needs depend upon the hair length. For the shorthair Selkirk a good combing once or twice a week will keep it in good shape. For longhair – a good combing two or three times a week removes dead hairs and prevents matting. 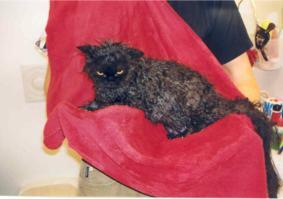 Bathing makes the fur curl up to its best advantage, so monthly bathing is recommended. Be sure to comb out the coat before bathing. Combing after the bath will straighten the coat and take out the curl. Humidity can also affect the amount of curl in the hair, just as it does with curly human hair. Spritzing the coat with a spray water bottle will enhance the curl. Not only are Selkirks cute and cuddly, but they make affectionate companions as well. Selkirks are gentle, sweet, playful cats that love to be loved. By being very people oriented and not shy about sharing their affection, Selkirks make excellent family pets. Selkirks are known for their mellow personalities and laid-back temperaments. They take life as it comes and tend to be easygoing, tolerant, and patient – courtesy of the British Shorthair, Exotic, and Persian influences. However, they are not couch potatoes – the American Shorthair and Exotic influences ensure a good game of fetch and particularly enjoy games in which their owners take an active role. As ever-present companions, Selkirks enjoy being held and cuddled, often seeking out their favorite human’s lap. They are not as vocal as some breeds, but they will let you know if all is not right in their world. Even though they are mellow and easygoing, they are curious and clever. Read here more on allowable outcross. And here - FAQ about Selkirk rex.